Digi-Schlock: PATRICK (Severin Films Blu-Ray/DVD Combo Pack) – Schlockmania! 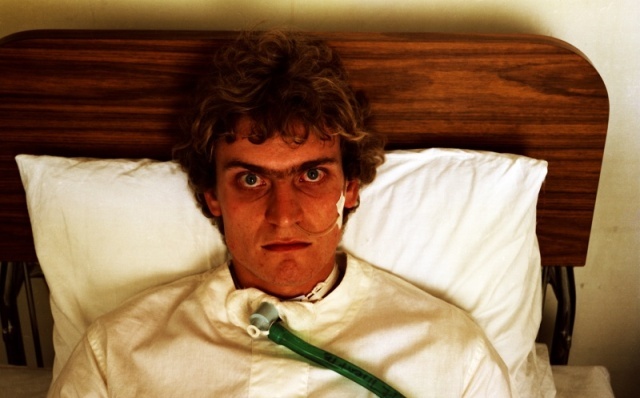 The grand finale of Severin’s slate of Australian genre fare is Patrick, the first thriller from future Psycho II director Richard Franklin. This new combo set maintains the quality of the releases in this slate by offering a worthwhile visual upgrade for the film plus a mixture of extras old and new. As with Severin’s other recent Australian film releases, Patrick benefits from a fresh HD transfer. The results do well by this low-budget effort, looking particularly nice on the blu-ray: colors are richer than in previous video versions of this title and the details have a new clarity. Film grain is noticeable throughout but this is a reflection of the film’s original shooting conditions. In terms of audios, viewers get a choice of the original Australian English mono mix plus French, Spanish and Italian language tracks. These are all lossy (not lossless) Dolby tracks. There are no subtitles for the foreign language tracks but Argento fans will still want to check out the Italian track as it features the Goblin musical score used for the film’s Italian release. The extras begin with a commentary track by director Richard Franklin that has been carried over from earlier DVD releases. It’s a low-key track, with Franklin waxing professorial as he lays out a lot of nuts-and-bolts information about the production. He talks about the background of each cast member (most came from t.v. or the theater), points out Patrick‘s many nods to Hitchcock films and reveals the lo-fi methods used to achieve the film’s special effects. Franklin also covers some other topics of interest. For instance, he advises writers to not do too much research up front and trust their own instincts. He also questions the validity of Hollywood’s three-act format and talks a little about a potential Patrick sequel that never got beyond the idea stage. Screenwriter Everett DeRoche also makes a brief cameo on this track to tell the darkly humorous real-life story that provide the idea for the film. Next up is just over an hour’s worth of interviews supplied by Mark Hartley from the interview sessions for his documentary Not Quite Hollywood. This offers a series of sitdown chats with actors Susan Penhaligon and Rod Mullinar plus Franklin, DeRoche and producer Antony Ginnane. They all express fondness for the film and share their memories of each other. Beyond that, each has interesting tales to offer: Mullinar reveals how Patrick helped create a breed of SFX technicians in Australia and Ginnane talks about the headaches created by the Italian knockoff of Patrick, Patrick Still Lives. Several of the participants also talk about the incident in which poor Robert Helpmann broke his back during the shoot, with Penhaligon offering the most informative account. There is also a vintage t.v. interview that appears to date from around 1980, as it prominently features clips from Franklin’s Road Games. It’s a pretty engaging piece in which Franklin discusses his American film school experiences, his training in Australian t.v. (a clip of one Franklin-directed show is included) and his frank thoughts about Australia’s need to focus on making their films more accessible to other markets. Some horror fans might be surprised to discover Franklin was a co-producer on The Blue Lagoon: he talks about that film and how his film school ties led to his involvement with it. The remainder of the extras are promotional materials. There is a theatrical trailer that sells the film as more of a rollercoaster than it is plus a trio of t.v. spots that focus in on particular aspects of the theatrical trailer (they all make great use of the title character’s creepy, blank facial expression). There are also a few easily-found Easter eggs that cover the same territory: a t.v. spot for a CBS Late Night screening of the film and the jaw-dropping, ultra-sleazy trailer for the Italian ripoff, Patrick Still Lives. In short, Severin has put together a nice special edition with a transfer that will please the fans and some informative extras. It’s a nice upgrade for an important piece of Australian genre-flick history. 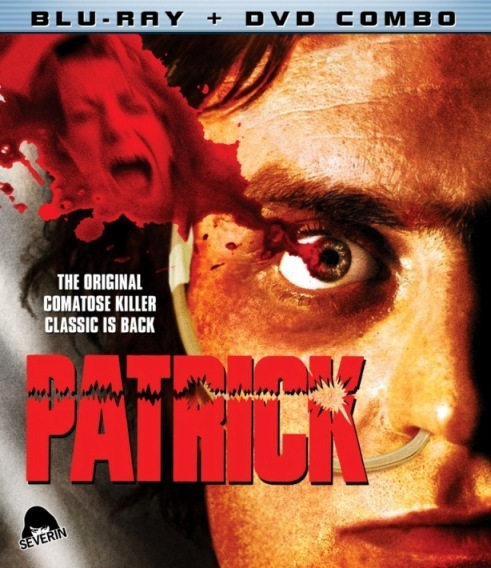 To read Schlockmania’s film review of Patrick, click here.